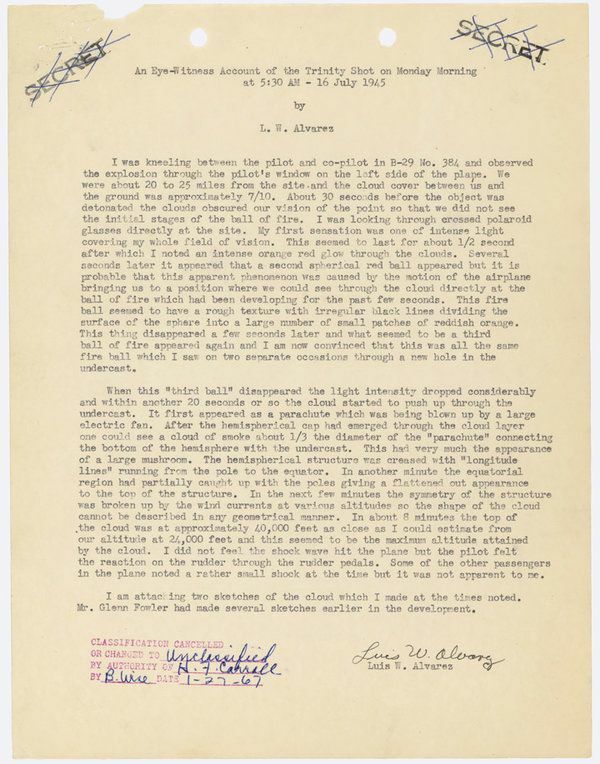 Source: U.S. National Archives, Record Group 227, OSRD-S1 Committee, Box 82 folder 6, “Trinity.” Transcription by Gene Dannen. 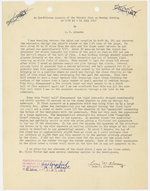 Document scans by U.S. National Archives, ARC identifier 594933. I was kneeling between the pilot and co-pilot in B-29 No. 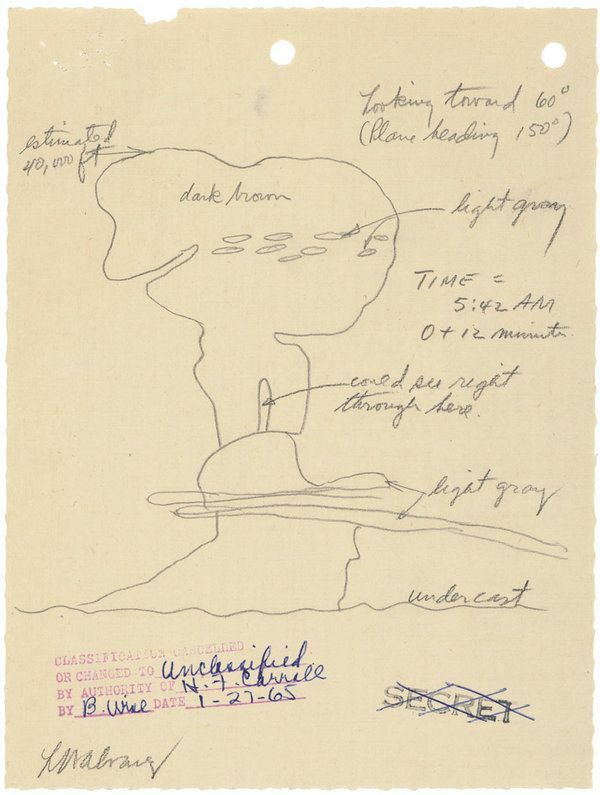 384 and observed the explosion through the pilot’s window on the left side of the plane. We were about 20 to 25 miles from the site and the cloud cover between us and the ground was approximately 7/10. About 30 seconds before the object was detonated the clouds obscured our vision of the point so that we did not see the initial stages of the ball of fire. I was looking through crossed polaroid glasses directly at the site. My first sensation was one of intense light covering my whole field of vision. This seemed to last for about 1/2 second after which I noted an intense orange red glow through the clouds. Several seconds later it appeared that a second spherical red ball appeared but it is probable that this apparent phenomenon was caused by the motion of the airplane bringing us to a position where we could see through the cloud directly at the ball of fire which had been developing for the past few seconds. This fire ball seemed to have a rough texture with irregular black lines dividing the surface of the sphere into a large number of small patches of reddish orange. This thing disappeared a few seconds later and what seemed to be a third ball of fire appeared again and I am now convinced that this was all the same fire ball which I saw on two separate occasions through a new hole in the undercast. When this “third ball” disappeared the light intensity dropped considerably and within another 20 seconds or so the cloud started to push up through the undercast. It first appeared as a parachute which was being blown up by a large electric fan. After the hemispherical cap had emerged through the cloud layer one could see a cloud of smoke about 1/3 the diameter of the “parachute” connecting the bottom of the hemisphere with the undercast. This had very much the appearance of a large mushroom. The hemispherical structure was creased with “longitude lines” running from the pole to the equator. In another minute the equatorial region had partially caught up with the poles giving a flattened out appearance to the top of the structure. In the next few minutes the symmetry of the structure was broken up by wind currents at various altitudes so the shape of the cloud cannot be described in any geometrical manner. In about 8 minutes the top of the cloud was at approximately 40,000 feet as close as I could estimate from our altitude of 24,000 feet and this seemed to be the maximum altitude attained by the cloud. I did not feel the shock wave hit the plane but the pilot felt the reaction on the rudder through the rudder pedals. Some of the other passengers in the plane noted a rather small shock at the time but it was not apparent to me. 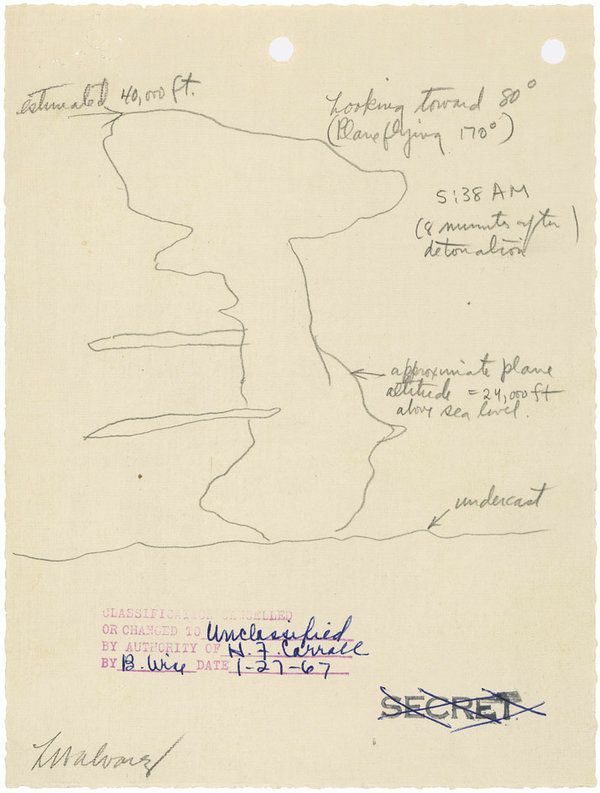 I am attaching two sketches of the cloud which I made at the times noted. Mr. Glenn Fowler had made several sketches earlier in the development.